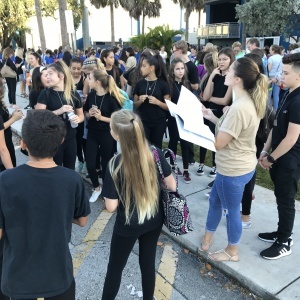 The new upstarts from Boca Middle Junior Thespian Troupe #88493 became the talk of the competition which took place all day on Saturday, November 10, 2018 at J.P. Taravilla High School in Coconut Creek Florida. Taking away 6 superiors, 6 excellents, and 8 goods, the troupe had two perfect score for one of their Large Group Musical Ensembles and another for monologue which also earned a critics choice award. Both large group ensembles received superior ratings as well as 3 of the 5 solo musicals. That is astonishing for the first time out. “Freak Flag” Large Group Musical ensemble waits in the auditorium for its turn to perform on stage. They got a perfect score of 30 and a superior rating from a set of very tough judges. 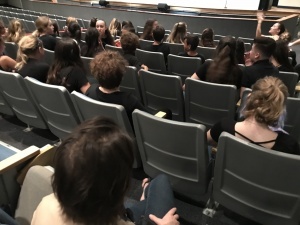 This is the first time BRCMS sent a Junior Thespian Troupe to competition and the group started out with the biggest bang possible: a perfect score in Large Group Musical the number “Freak Flag”. The group hit the audience with a cacophony of belting voices and animated actors with a choreography what was spot on. Each actor played their part with confidence, energy and enthusiasm and not only blew away the audience, but the judges as well. They received a perfect 30 score and received a thumbs up and a smile from the tough judge who had “delighted” written all over his face as the group went back to their seat. “Freak Flag” from the musical “Shreck” with Kaiden Bartrum, Olivia Cigale, Elizabeth D’Amico, Luanda deHilster, Felicity Lim, Breanna Lowe, Valentina Parton, Alejandro Quinones, Kailei Roa, Antonio Saladino, Kat Sigalos, Peyton Sklare, Hilary Stratton, and Valerie Torres (* going to State Competition). The second Large Group Performance equally impressed the judges with their musical number “Pandemonium”. Although this author did not see this particular performance, it obviously impressed the judges who rarely give out superiors for Large Group Ensembles. This group of talented actors, singers, and dancers wowed their way to bringing home a second superior rating for Large Group Musical making it a full sweep for this category. “Pandemonium” is from the musical “The 25th Annual Putnam County Spelling Bee” with Ava Callahan, Deric Guevara, Sela Kelly, Maia Martinez, Jayleen Perez, Elyse Potash, Hannah Rangel, and Kashane Reid (* going to State Competition). Ms. Nolan before entering the school early morning on Saturday taking the inaugural Junior Thespian Troupe #88493 to its first district competition. 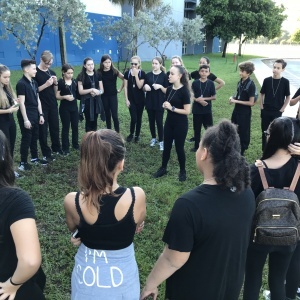 Boca Middle Troupe 88493 sent a strong team which earned the right to compete for the most coveted solo position in thespian competition: Solo Musical. Again, 88493 did not disappoint with the majority of the Solo Musical thespians earning the highest rating of superior. Layla Dahan, Julia Gonzalez, Luanda deHilster all “killed it” as they say with their performances, enough for all three to bring home superior ratings. Layla Dahan sang from the song “Part of Your World” from the musical “Little Mermaid” and won her superior with her beautiful voice and poise (* going to State Competition). 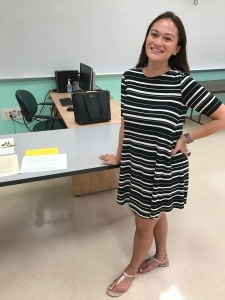 Julia Gonzalez killed her performance of “Ireland”, a mature piece which fit her beautiful soprano voice and quiet acting skills which impressed the judges. There was no doubt in anybody’s mind that what they just saw would bring another superior to the group. (* going to State Competition). Phoebe Pelton received an excellent for her rendition of “Alto’s Lament” giving yet another medal to the troupe’s successful competition. Congrats to her! Troupe 88493 members warm up early morning Saturday before entering JP Taravilla High School in Coral Springs Florida for their very first district competition. Jayleen Perez gets the “warrior” award from this reporter for her rendition of “I Speak Six Languages” from the musical “The 25th Annual Putnam County Spelling Bee” when half way through her solo, she blanked on the words of the song, but hung in there. Never panicking or “loosing it” (which would be understandable), she finished her performance even though she knew it didn’t go as well as it could have. She really killed it in her rehearsal but she was greatly applauded and complemented by the judges for not giving up and not being flustered. Jayleen won one of the leading roles in this coming spring’s musical “Little Mermaid” playing Ariel and has a beautiful voice and graceful acting skills suiting her perfectly for the part. Ava Callahan did the monologue “Dorthy” from the wizard of Oz receiving an excellent medal for her efforts while Elyse Potash received a good rating for her monologue. There were a total of four Small Group Musical groups from Troupe 88493 with one winning a medal and two receiving a good rating. These groups were composed of all grade levels and shows great promise for the coming years. “Omigod” with Kat Sigalos, Valerie Torres, Maia Martinez, Felicity Lim, Olivia Cigale, Olivia Schmitt received an excellent rating and medals for their rendition (* going to State Competition). “Summer Lovin” from “Grease” received an excellent rating with Alejandro Quinones, Antonio Saladino, Peyton Sklare, Kailei Roa, Hilary Stratton receiving medals for their efforts. “Mama I’m a Big Girl Now” with Jules Carlin, Martina Restrepo, Navaeh Cox, Tara Gaylas, Angalisia DiPietro received a good rating. “Seize the Day” from “Newsies” by Ylan Hatri, Eric Lerner, Kaiden Bartrum also received a good rating. There are some people who simply are better together than apart. That describes Antonio Saladino & Alejandro Quinones to a tee who received an excellent rating for their duet “Agony”. The two actors and singers seem to feed off of each other exhibiting a closeness that is obvious in their performance. With the low baritone voice of Saladino, to the higher-pitched voice of Quinoes, the two were a delight to watch and captured a great “happy hands” applause when finished. “Agony” from “Into the Woods” with Antonio Saladino & Alejandro Quinones received an excellent rating and with it medals. 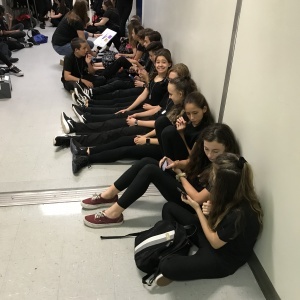 This is how Troupe #88643 spent half of their day: sitting in hallways, waiting to enter classrooms where they competed successfully at the 2018 Junior District competition. Elyse Potash was the only troupe member to perform a Pantomime which was done quite impressively with her moving about the performance area, performing with nothing but her facial expressions and body movements. Her effort earned her an excellent rating and medal. 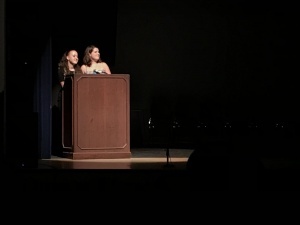 Co-President Luanda de Hilster on stage behind the podium during the awards ceremony in the large auditorium representing Troupe 88493. Makeup Design and Costume Design were represented by troupe members Peyton Sklare and Phoebe Pelton respectively. Both were required to produce drawings and give a description of their work. Both were complemented on their drawings. There were great lessons to be learned for future troupe members in the coming years including doing extra research on the musicals or plays they are representing and thinking “outside” the box. Another important lesson was to state from what period the costumes or makeup would be. In Makeup, the judges were also looking for the normal makeup that make up the base of the character including highlighting or changing the cheekbones look and sculpture of the face. On the fashion side, the judges mentioned that they love “different, innovative, outside-the-box” designs. Peyton Sklare and Phoebe Pelton both received good ratings for their efforts. 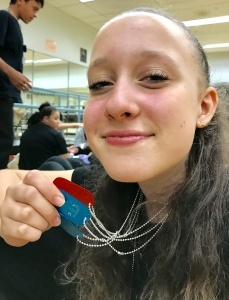 Luanda de Hilster holds up her three medals – two superiors and one excellent making her the only member of Troupe #88493 to medal in all three of her modalities of Large Group Musical, Solo Musical, and Duet Acting. All from Troupe #88493 are stars. It is a very impressive group of talent, powerful voices, great acting, and a love and respect for the craft of drama. But one person did stand out in the group’s inaugural competition, earning medals in all three of her events. Luanda de Hilster won superior in Large Group Musical, superior in Solo Musical, and Excellent in Duet Acting. She also represented Troupe #88493 on Stage as one of the MC’s of the evening ceremony for contest winners (see photo above). One of the judges for the Large Group Musical called Luanda a “Rockstar” with her powerful voice and presence coming through on stage. Luanda will be taking all three of her modalities to the State competition in January at the Kravis Center in Orlando Florida. Can she repeat the “feat”? We are routeing for her and the entire troupe! Luanda will also be playing one of the lead roles “Sebastian” in the upcoming spring musical “Little Mermaid”. It is not a surprise that when this author went into one of the competition rooms that a door person asked us which school we were from. When one of the troupe members said Boca Middle, the door person said, “great school and great group. I heard about you guys”. It was only a few months ago that Troupe #88493 was officially registered as a Junior Thespian Troupe. Who would have ever dreamed that two thirds of the groups and individuals would receive superior and excellent ratings. But that is what happened. No poor ratings at all! Ms. Nolan has not only taken the initiative in starting this group (which is a ton of extra work), but has put together a great team of singers, actors, and technical people that now have a lot to shoot for if the 2019 competition wishes to match it’s 2018 results. And from a look at the 6th and 7th graders, there should be no problem in meeting or even surpassing the 2018 results – the results from the inaugural season of Troupe #88493. None of this could happen without the directors directly responsible for this new Troupe: Ms. Lauren Nolan, and the previous director Joshua Tay. “Mr. Tay” as the students affectionately called him is responsible for creating the drama club and two of the grades that competed this year at district were students of his and boy! I’m sure Joshua is extremely proud of everyone given he follows everything on the Boca Middle Drama website and Facebook page, sometime even commenting on what he sees. But a special thanks goes to the new director, Lauren Nolan who as promised, delivered the inaugural competition group Troupe #88493, receiving 6 superior, 6 excellent, and 8 good ratings out of the gate making a huge impression with the judges and other groups at districts. Her boundless enthusiasm, talented guidance, and love of drama and all her kids is quite remarkable in the few months she has been at Boca Middle. Without these two, this Troupe would not exist along with their success. Early January, Troupe #88693 will get a chance to compete for the first time at the state level where they will present 6 superior and 2 excellent rating performances at the renown Kravis Center in Orlanda Florida. We wish Troupe #88493 all the luck in the world at the states where they hope to repeat their success at districts. And this reporter looks forward to watching it up close and personal and will be back to report this event!